Parasound is a name which will be familiar to those interested in American audio, but historically it's not had much visibility in the UK. The P3 preamp and A23 power amp are part of the company's 'Halo' range, value audiophile products designed in America but built in Taiwan. Very nicely built, too - the cases are well finished and exceptionally solid, while the look and feel are generally first-rate. 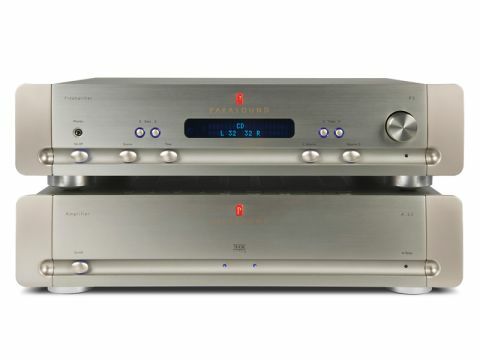 The P3 preamp is well equipped with inputs, including a balanced line input and also a phono stage. A little confusingly, the phono alternates with one line input and selection between the two is by rear-mounted toggle switch: another toggle selects between balanced and unbalanced for 'Direct 1'. Two 'direct' inputs are selected by relays and have nothing to do with the (electronic) tone controls, while others are switched electronically. The actual amplifying is done by op-amps, an impressive number of which adorn the main circuit board. The A23 power amp uses mostly discrete transistors, including three pairs of output devices per channel, with a large toroidal transformer giving near-dual-mono design. A choice of balanced and unbalanced inputs is given and the amp can be configured in bridged mode for massive (mono) output.